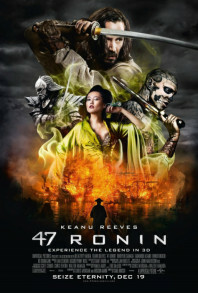 Lavish, English-language account of the 47 ronin story with a few Hollywood embellishments, like CGI monsters and a white guy in the lead. The story is constantly divided as to where to position Keanu Reeves’ character in this well-established narrative. He plays Kai, a runaway “half-breed” taken in by the Ako domain, raised by the Tengu – a mysterious, forest-dwelling, alien-like set of sword-makers – and capable of great fighting abilities, although its unclear as to where he has acquired these skills considering he has spent his adult life as a social outcast within the Ako. Kai also becomes something of a de facto leader of the 47 ronin when their leader is forced to perform seppuku after attacking the governmental scourge Lord Kira (Tadanobu Asano). He wins over the hearts and minds of the remaining clan members, undermining their star pupil, Oishi (Hiroyuki Sanada). Kai’s motivation is born out of love and less about honouring the Bushido way. He harbours a lifelong affection for the film’s damsel in distress, Mika (Ko Shibasaki) – the Ako Lord’s daughter – who, like in a fairy tale, is arranged to be married to the film’s pantomime villain, Lord Kira, which acts to slightly undermine the real message behind this poignant Samurai tale. The initial conflict between Kira and the Ako is also somewhat distorted. In this version, it is shown to have been orchestrated by a witchy, medusa-like shape-shifter played with great histrionics by Rinko Kikuchi, who manipulates Lord Kira in his bid for power and poisons the Ako leader. She’s a sensual cipher for Lady Macbeth who can turn into mythical beasts, like a wily fox or a mad dragon snake thing, like she does at the end. She is the film’s most memorable character, even if she completely deposits the film into the realms of fantasy. During a swashbuckling sequence which conjures up Pirates of the Caribbean, it becomes clear that director Carl Rinsch is focused more on creating an adventure film in Japanese dressing, rather than providing any real insight into the period. Once that’s firmly established, the film is actually quite entertaining, and Reeves is perfect for this kind of deadpan delivery.